Once an entrepreneur, always on the run. Strategies to implement, operations to run, teams to motivate, clients to serve, a business to keep alive and grow. So many things to do, all important, so little time and so many variables out of your control. Those in the startup world out there – you know what I mean. When was the last time when you actually took a couple of hours to design, write, code or create something passionately? Yes, managing the team, handling finances and operations, talking to customers, suppliers, partners…that you do daily from dawn till dusk. You wish you could take your time and think, analyze, create, project, envision. But who has the time when everything seems out of control, especially when money is concerned? Running a creative digital agency meant all of the above. More so, whenever it came to analyzing where the money went, what needs to be paid, who is yet to pay us – an ugly headache. It really felt that I was losing control and it always took a lot of time to do calculations, get all the receipts and invoices, figure out how to get money for bills until the clients paid the invoices. No matter how hard I tried to stay organized, something was always slipping; somehow the end of the month was always a pain. I used spreadsheets to track the cash flow, but it took too much time. Things started to get quite complex, quite quickly. The end result – frustration; which lead to procrastinating until I ended up even more frustrated. Sounds familiar? A manager’s mission is no easy thing, especially when money concerns add on top of everything. You do your best to take care of everything and at the end of the day, there is little energy left. I know it well. So I took the matter into my own hands. I imagined the tool that could make things way easier: a dedicated platform to help managers like me to handle cash flow with as little effort as possible. After years of working in product development, helping other startuppers build their dreams, I decided to take the leap and immerse fully in the startup adventure. Together with a great team, I built ThinkOut, the cash flow management platform so that at least a bit of a manager’s tough job would feel more comfortable. We started by solving the major sores and little by little, building on the feedback, we came up with new solutions until we got the painkiller product we were looking for. Let me tell you a little how it helps you to gain control over the cash flow. First things first: what is ThinkOut and what does it do? It’s an online platform used to plan and track the revenue and expenses of your business by day/month/year, so you always know how much money is available at what time, what needs to be paid and when. We’ve automated as many actions as we could, to help save time. What you need to do is to fill in the transactions in the dashboard table called cash plan, then the platform takes care of the rest: calculations, graphs, analytics, a list of upcoming transactions, currency conversions and notifications. An issue I felt we needed to address was the ability to make accurate forecasts. The better the cash plan reflects the reality, the more chances to stay out of trouble. Easier said than done. Often times what I expected didn’t quite match the real transactions; nor the time, neither the value, which meant I had to reconsider the plan. With ThinkOut we made it possible to see both the initial forecasted value (and date) and the actual, realized one, provided you keep it up to date. It goes like this: when you fill in the cash plan, you either enter a sum you already paid or cashed in and that is the actual one. But you will want to plan ahead and fill in expected income and expenses for the upcoming months. Those will be the forecasted values. Once those transactions take place, you go to the cash plan and add their real value, on the actual date. You should do that as often as possible, to get the best out of the platform. What TinkOut does is that it turns those actual values in different colors, but it also keeps what you’ve first entered as forecasted. This way you can always look back and compare to understand the differences and adjust future predictions. Remember, for that to happen you need to update the cash plan constantly. I used to spend hours trying to decide what to do: make that investment I wanted, how many people hire, move to a new, larger, prettier office. The big question was not if I needed to make those expenses, but whether I could afford them. So I spent a lot of time making various calculations and what-if scenarios because I kept losing track and forgot sums in the process, so I had to start all over again. A nightmare, that’s how it was. So I really wanted to solve this problem with ThinkOut. We made it possible to easily build multiple scenarios starting from the initial cash plan. You just add or remove expense and income categories and fill in different values, according to your hypothesis. The best part is that while you fill in your assumed sums of money, there is a graphic for each scenario that shows the cash flows evolution, so you can compare them in real time. You get to see in which hypothesis you run out of money faster, which one keeps your cash positive for a longer time. It always felt discouraging to fill in every expense and revenue source, so the bank integration feature was a top priority. After some hard work, we managed to implement it and now you can connect your bank account to the ThinkOut account and the transactions in the bank account statement are added to the cash plan. You just import the list of operations and match them to the forecasted ones in the cash plan, or just add them as new. If you already had forecasted transactions, the values from the bank account will appear as actual values in a different color, so you can make the difference between what is yet to happen and what has already been operated. No more looking through receipts (at least not so much) or remembering exact sums and dates. I can tell you, my memory is very grateful to me now. When I used to look at my cash flow excel tables, I was founding it frustrating not being able to see past modifications, so I could understand what changed and when. That is mostly annoying especially when you are not the only one filling in the cash plan. You need to ask the other person(s) what they did and why then bet on the other(s) ability to recall. Did it ever happen to you to forget to pay some bills or realize at the last moment you just don’t have enough cash available to pay a supplier? Well, it happened to me, no matter how many reminders I put on the phone. Sometimes I even forgot to set the reminder. So I “delegated” ThinkOut to deal with these issues. We built a feature to record the user activity for each account, so you can check who did what and when on the cash plan. Plus there is a list of upcoming transactions (payments or cashing ins), so you know what to expect the next week or month. And if you forget to check on ThinkOut, it sends you an email with the list of overdue and upcoming transactions. 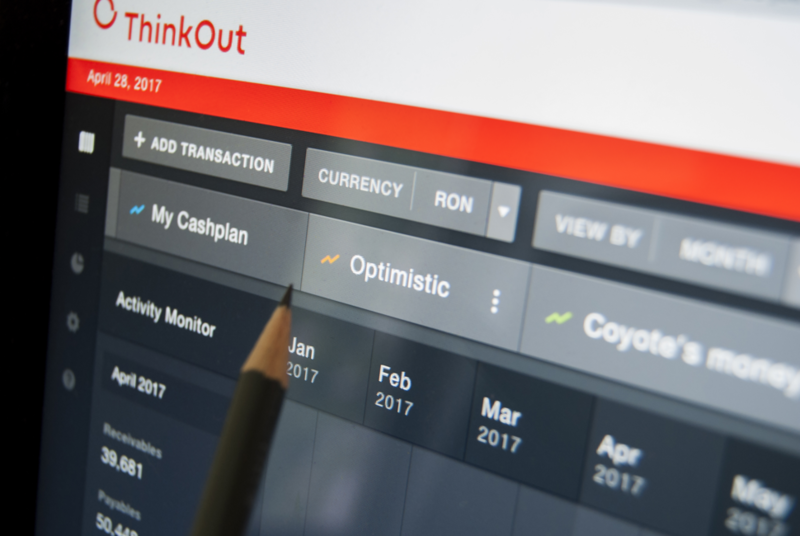 I have to admit I am really enthusiastic about what ThinkOut can do for managers like you and me when it comes to taking control over the business cash flow. But hey, I might be just a little subjective. But really now, all our users felt a real relief after using it, so I invite you to try ThinkOut and see for yourself. Whatever you decide, just don’t let poor cash flow keep you from realizing your dream. Take control; track, forecast and plan your money movements. If you can do that in a simple, comfortable way, even better. You’ll feel the difference.